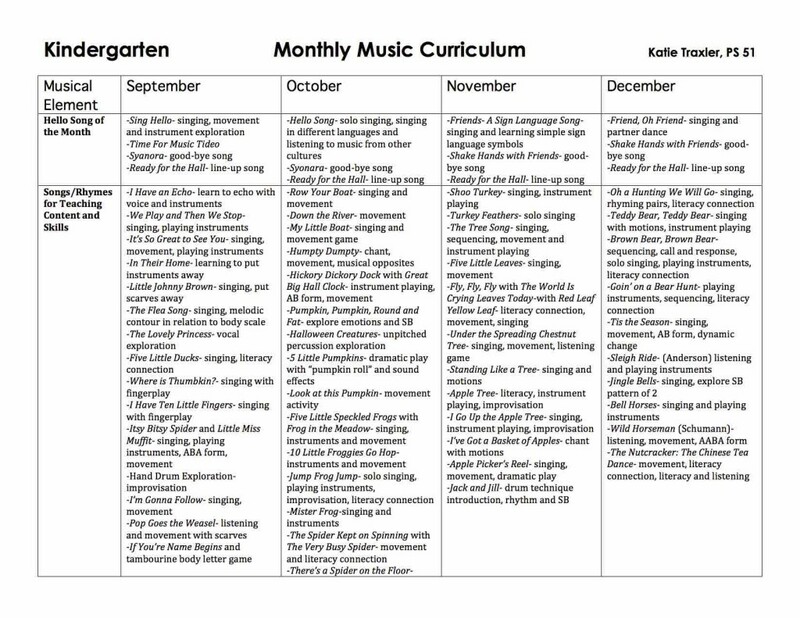 These curriculum maps are specifically designed for our music students at PS 51. They have been carefully crafted over the past several years. They are aligned with our integrated study units in science, social studies, or ELA that our classroom teachers have designed and scheduled when appropriate. They also incorporate our partnership curriculum (NYCB, Carnegie Hall) when applicable. They do NOT account for the changes in scheduling each year. Some years a grade level may have music once a week in the fall and twice a week in the spring, but the next year it may be reversed. Some grades only receive music once a year for the entire school year. Keep in mind that testing weeks and holiday vacations change year to year as well leaving some months with more or less teaching days than in the past. A curriculum is a living document that changes and adapts to the situation at hand. Because the schedule changes each year, there are some activities and lessons that will be omitted on certain years. However, rest assured that the music content, vocabulary, and performance skills that are taught in that particular song or lesson are being covered in other ways so as to maintain a well-rounded and rigorous music education for all students at PS 51. Below is an example of the first page of Kindergarten Map 1. November 28, 2015 in Curriculum Maps.